Whew! I am finally back from CHA. What a whirlwind of fun and excitement. There were so many old and new friends to meet and share hugs with. 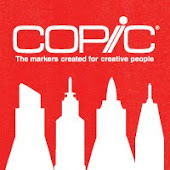 A big THANK YOU to Splitcoast Stampers for their promotion with Copic and the loan of the cute furniture. Now you're probably all wondering what was happening around the Copic Booth. Our new item to be on the lookout for later this Spring is a 72pc. wallet. Check this out! 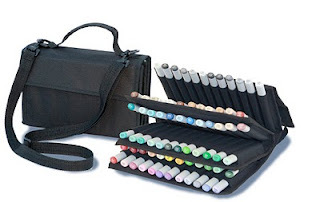 It comes with an adjustable carrying strap and holds 72 of your favorite markers in a similar case to our existing 24 and 36pc wallets. Again, these will be available in a few months so don't go bugging your local store for them quite yet. Jenny Doh stopped by and snapped this cute photo of me with my new hair (thank you christy from spellbinders!!). The "Art Saves" sign we're holding up is to remind you that art saves lives. Jenny has a product line where 100% of the proceeds go to charity. It's her way of making sure that art saves. Traci Bautista also stopped by for some altered arts demos in the booth. Our whole team was inspired by her free-form doodles and creative energy in her journaling. Traci's work has been featured on the Copic website for the last few months as our featured artist. I wish I had more chances to wander the show and see all the fabulous things. 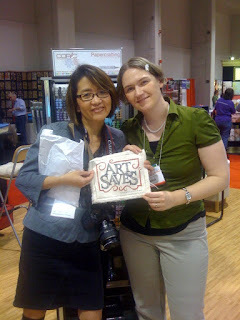 At the CHA SuperShow it was so much fun to see everyone coloring at the SplitcoastStampers booth. A lot of beginners had a chance to use Copic markers for the first time. Hopefully if you couldn't make it to the Winter show you'll be able to stop by their booth at Summer CHA. We had our whole instructor crew at the show. There were many giggles, hugs, and of course lots of coloring going on. Here is Debbie Olson showing some blending techniques to a few of the many people who were curious about how to use Copic Markers. I need to head to bed now, but I can promise that the second surprise from CHA will be announced next week, with a blog candy prize, so stay tuned! 1. The Certification Student Manual is finally done!! People at the certification classes this weekend will be getting a copy of the book to take home. It is 72 pages jammed full of useful tips for people who are going to be teaching Copic marker coloring to other papercrafters. These should be available to order near the end of February, look for details e-mailed directly to past attendees. If you get it today, leave a comment here telling people what you like about it. 2. If you will be at CHA, stop by to get a sneak peak at a few new surprises. I can't spill the beans, but if you're going to the Wholesale show our booth is 2562. Otherwise you'll have to wait a week or so to see the announcements. 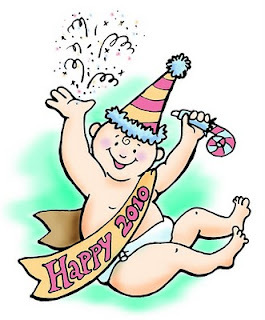 If you're at the consumer Supershow, then stop by the SplitcoastStampers booth to color witht he markers and glitter pens, and say Hi to all the wonderful people. Look for other make-n-takes across the show floor. Feb. 17th & 18th Frankfurt, Germany Certification classes taught by Marianne Walker. 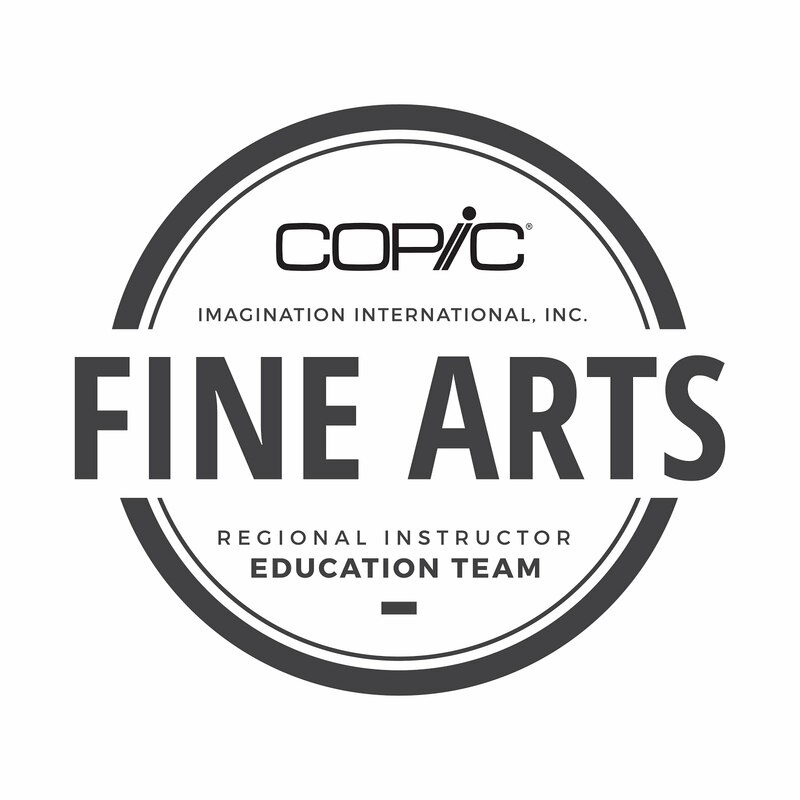 Otherwise, stop by the Copic booth to meet our regional instructors, find a class near you, set up your own special event with the Copic Team, and learn some tips for teaching your own successful Copic Classes. Meanwhile, I'll try to post while I'm at the show. I really need to post some new tutorials. What do you want to learn that I haven't already covered? Leave a comment and I'll see what I can do :) Have a great week!! Note: March 6 is the actual date for the Des Moines Certification class. My last post was incorrect. 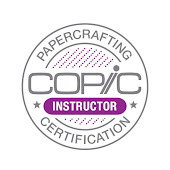 Over the last two years, and with much trial and error we developed the Copic Certification Program. This Fall we added and trained our new instructors who will begin teaching right after CHA. Colleen, Lori, Kathy, Sherrie, Debbie, Sharon and Sally Lynn all got a new instructor manual with their training, but I hadn't finished the Student Manual when we had our meetings in November. 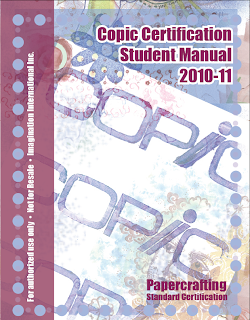 Now, as of 2010 CHA, ALL people attending Copic Certification will walk away with the new Copic Certification Student Manual. This book, which is being completed in the next two weeks, will be about 50+ pages of instruction geared for anyone who is attending (or has attended) Copic Certification classes. It is NOT a book that stands alone, rather it is a workbook or refrence book to accompany the class. Anyone who attends a class in 2010 automatically gets the new manual. People in the Sarasota class will get manuals mailed to them in a few weeks, as the books will still be at the printer's and not quite ready yet. If you have already taken a Certification class and would like to purchase the new manual we will have more information following CHA on purchasing the book and you will get an e-mail with ordering information. This is ONLY for people who have taken the Certification Class at this point! I know all of you are eagerly awaiting a book for the general public, but first things first. In the meantime, enjoy my blog and register for a Certification in your area :) Keep looking for more details when those manuals will be ready. Please DO NOT e-mail us at this point asking for more info about the manuals, as they are still in production. March 7th, Memphis, TN Taught by Sally Lynn. Applications have not gone out yet.